I am not especially good at mornings. On a normal morning I stumble out of bed and blindly (I mean this literally since my contacts are not yet in my eyes) fumble around for the coffee. Only after I’ve had a solid 10 minutes to start sipping my steaming mug of coffee and prepare breakfast am I suitable for conversation. Call it a character flaw, but it is what it is! Unless, of course, I’m at the Snow Farm. 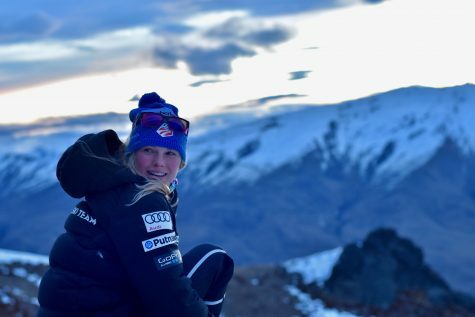 Then I’m up and out for a morning walk with my teammate and roommate Julia Kern because we just can’t wait to go watch the sun come up. Over the mountain range it creeps, lighting up the peaks with a orange, pink and purple glow. 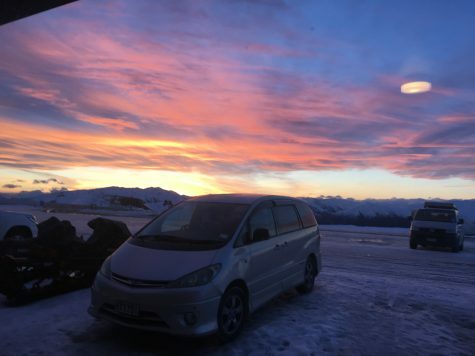 Does it sound cheesy when I say that mornings are somehow magical in New Zealand? A sunset view out our bedroom window (hence the glare). I think the reason I absolutely love bouncing from training camp to training camp is that they’re always so wonderfully predictable. Life at camp is a strange paradox: living is simple and easy. Except, of course, when you’re training hard and pushing yourself mentally and physically on the trails. But then again, I love this stuff. I live for those moments when you round the corner on the trail and see the beautiful view ahead of you, and you can’t help but pinch yourself. 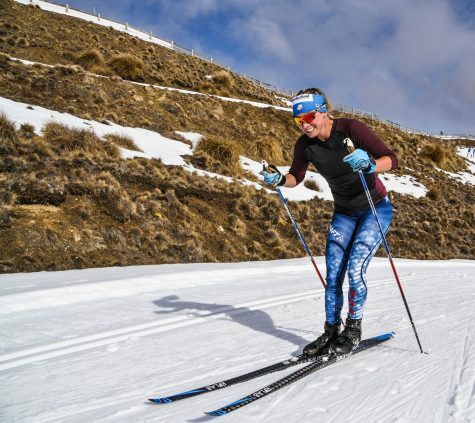 No amount of training really feels “hard” or “impossible” when you’re just excited to be out there! Cork striding out into the sunset. 7:30am Wake up in our dorm-style room and throw on a jacket and pants, hats and gloves. 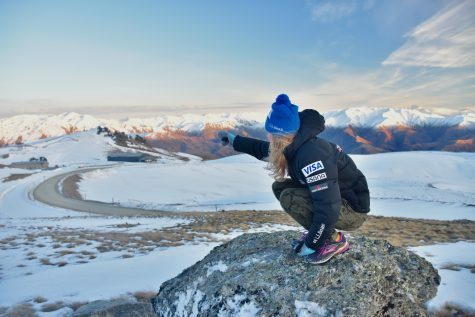 My roommate Julia and I will go walk around to admire the sunrise and scout out the best hobbit hiding holes (the fact that Lord of the Rings was filmed here is never lost on me). 8:00am Breakfast in the main dining room. Because coffee is life, I travel with an aero-press coffee maker and bag of grounds. We proceed to enjoy a ton of food in the name of training. 9:00am Meet in the coaches room to look at a little video to help us visualize good technique for the training ahead. 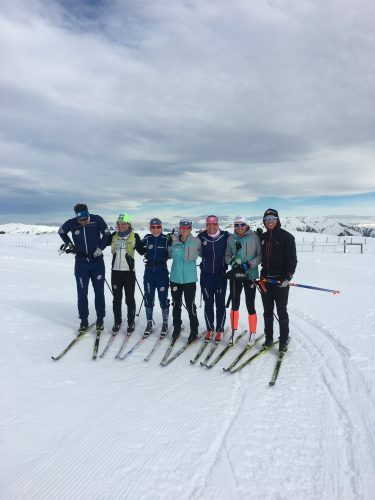 We’ll also go over the focus of the workout, be it speeds, intervals, some technique work during a long distance ski. 9:15am Downstairs we’ll go, and 5 steps out the door we find our wax room, built underneath the main lodge building. 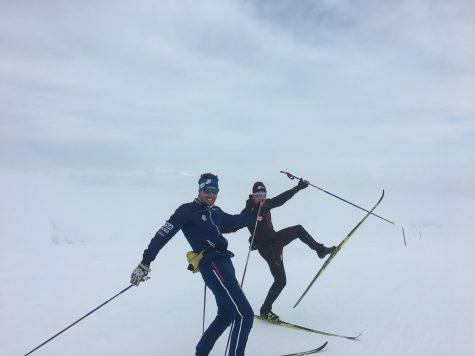 The coaches will prepare our skis for all important training sessions but we also do some of our own waxing. Although as the camp progresses and we get more and more tired, the coaches kindly take on more and more of all waxing duties so we can put all our energy and time into a quality training session. Then we’re out skiing! 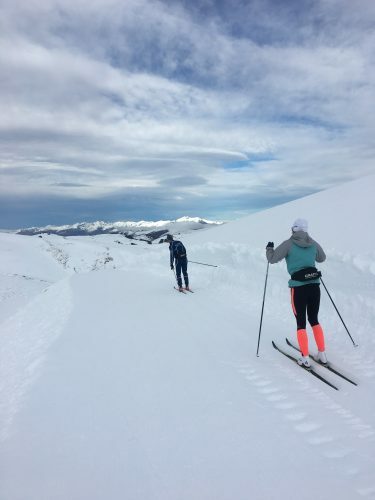 The snow farm trails start literally 1 foot out the door, and there are about 40km of groomed trails to enjoy. 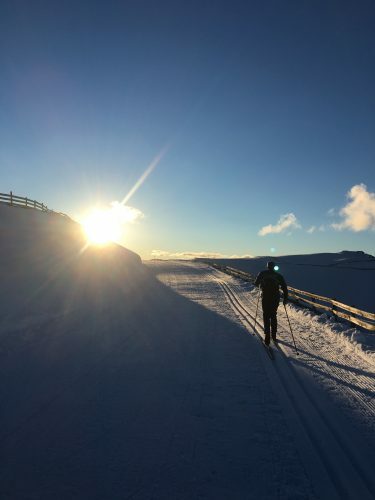 Morning training sessions usually last 2 – 2:30 hours and if we’re doing speeds or intervals, those happen during the morning session. 11:45am Come back in from skiing, stretch, foam roll, take a quick shower and get to the dining hall in time to beat the lunch rush. 12:15pm Eat, eat, eat! The food here is some of the best I’ve ever had at any training camp. There is always fresh salads and fruit, a couple different types of carbohydrates like sticky rice or noodle dishes and a couple types of protein like mutton or chicken or beef stew. I’d describe the type of food as asian-polynesian-british fusion. 1-3:30pm Hang out and do sponsor work on the computer, take a nap if it’s been a big training day, take care of any body care you need to do like stretching or foam rolling. 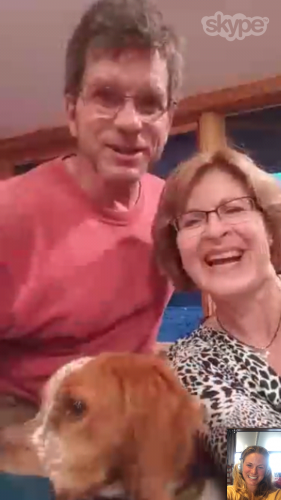 My birthday Skype call with my parents – and Leo the puppy popped into the frame to say hi, too! 3:30pm Get ready for afternoon training! 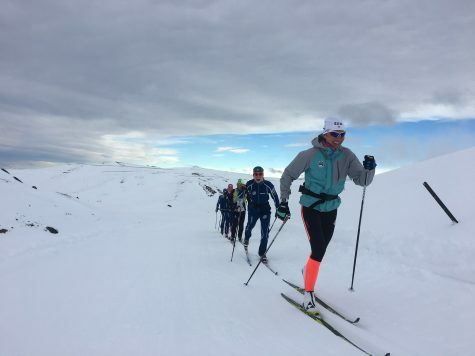 In the afternoon we’ll train anywhere from 1-2 hours, depending on the focus for the day. 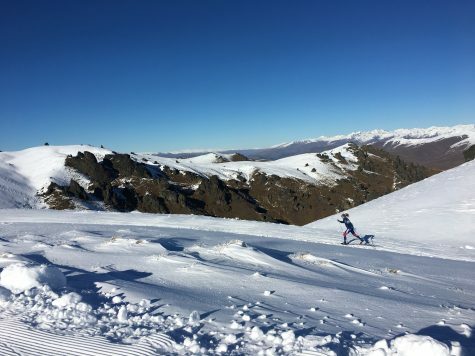 Sometimes it’s a 30 minute ski and then strength at the little gym up at the Snow Farm, sometimes we drive down to Wanaka to run and lift at a bigger gym there, and sometimes it’s just a 1.5 hr easy distance ski to work on technique. The striding train heading up into the mountains. Simi and Ben being goofballs. Another fun downhill with Matt and Sophie! 7:00-9:00pm We’ll often hang out talking and visiting after dinner, enjoying mugs of tea. We might even watch the All Blacks play rugby on the projector screen, and there will be lots of yelling and cheering. But by 9pm I’m always getting quite tired and it’s time to get ready for bed! 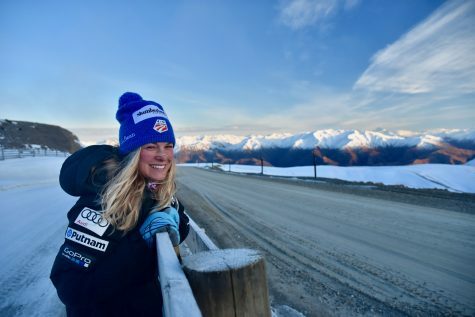 At the Snow Farm I usually sleep between 9-10 hours a night which is crazy, but something about the quiet of being on top of a mountain combined with nice cold dark nights and hours of skiing let my body totally relax and sink into sleep. Then we’ll do it all again the next day!